This 22″ by 23″ sign is advertising Ice Cold Coca-Cola. The sign is red on the upper half and green on the lower half. The triangle shape points downward and the top has additional embellishments. 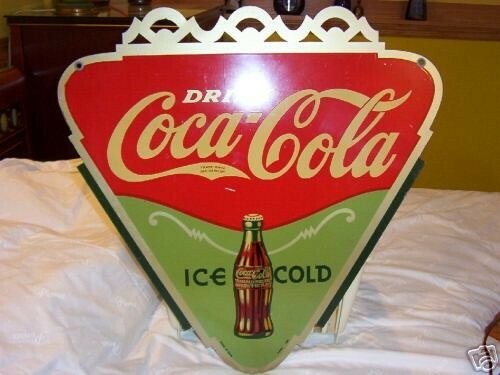 The text on the sign reads “Drink Coca-Cola Ice Cold.” In the bottom center there is a realistic illustration oc a Coca-Cola bottle.